DAYTONA BEACH, Fla.—The #02 Chip Ganassi Racing Ford EcoBoost-powered Riley Daytona Prototype driven By IndyCar stars Tony Kanaan and Scott Dixon, and NASACR aces Kyle Larson and Jamie McMurray finished first in the Tudor United SportsCar Championship Rolex 24 Sunday, earning the team a record six wins in twelve entries. After losing seven minutes Saturday evening repairing a broken splitter and radiator plumbing, the #02 car fought its way back to the front of the field, spending most of the race either chasing or leading the powerful #10 Wayne Taylor Racing Dallara-Corvette. The #10 car and the #02 were very evenly matched; through the final hours Scott Dixon battled Jordan Taylor, neither able to escape the other. Entering the final hour, both teams realized that fuel strategy might decide the race. The Ganassi car had been getting a lap or two more out of each tank of fuel, which could have been decisive depending on how things played out. Knowing the #02 had the edge in economy, the WTR car pitted early in its fuel window, hoping that a caution period would trap the #02 on track. That caution period came, burr not before Chip Ganassi race strategist Mike Hull , far too experienced to be fooled by the simple stratagem, summoned Dixon into the pits for fuel in the #02. With 17 minutes left in the 24-hour race, two cars collided while passing, one hit the wall and caught fire. No one was injured but cleanup took about ten minutes. AAs the field prepared for the restart, the Taylor camp was confident: their car hooked up well on restarts, better than the Ganassi machine. Driver Jordan Taylor figured he could get a jump on Dixon and then simply not let him by for the final three or four laps to win the race. Unfortunately for Wayne Taylor Racing, someone in the camp had not done his sums properly. Jordan Taylor had unwittingly exceeded the maximum allowable seat time for a single driver, and had to pit or be disqualified. Jordan’s older brother and co-driver Ricky had to be roused, dressed, and rushed into the car with no notice. After making the necessary driver change and rejoining, WTR was then assessed a drive-through penalty for pitting while the pits were closed under yellow. This penalty ended all hopes for a WTR win, Ricky had no chance to close the gap to Scott Dixon in the few minutes remaining in the race. —came to Daytona with a car as good as any in the field piloted by some of the best drivers in the world. As always the crew (including many off-duty IndyCar mechanics) performed flawlessly, the strategy was perfect. Every routine was planned and practiced, every eventuality dealt with swiftly. Chip Ganassi Racing showed how it’s done. Yes, the team had good luck, while others got some bad breaks, but Fortune Favors the Prepared, it is sometimes said. 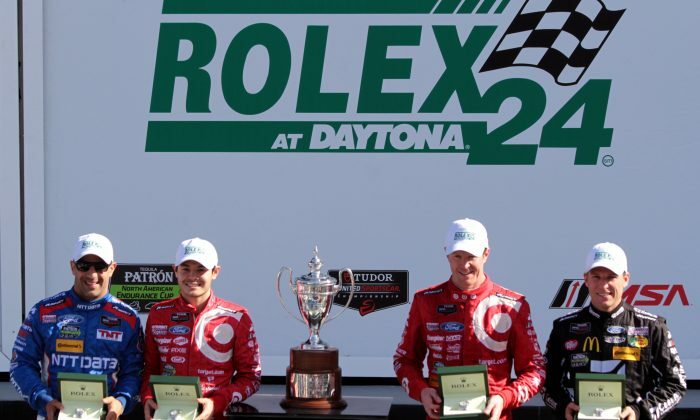 Making no mistakes and coping excellently with every problm never guarantees victory, but in this case, it earned Chip Ganassi Racing its sixth Rolex 24 victory. The #3 Corvette Racing C7.R driven by Jan Magnussen, Antonio Garcia, and IndyCar Star Ryan Briscoe made no mistakes, had no accidents, and suffered no mechanical issues, to win the GT Le Mans Class of the 53rd Rolex 24 at Daytona. This was no easy feat; the ultracompetitive GTLM class features factory teas form several manufacturers, as well as some top-tier private teams. At different times through the 24-hour race, the Corvettes were forced to chase the #62 Risi Ferrari, the #911 Porsche North America 911 RSR, the #17 Team Falken Tire Porsche 911, and the #25 BMW Team RLL Z4 GTE. Every competitor had some sort of problem—engines exploding, collisions with competitors, even a collision with a teammate in the case of the #9911 and #912 PNA RSRs. The Corvette drivers laid down fast laps, avoided problems, and in the final hour managed to chase down and pass the one remaining opponent, the #25 BMW. After 24 hours of back-and-forth fighting, the #3 finished the race less than half a second ahead of the BMW— but margin of victory doesn’t matter. All that counts is who finishes first; the Corvette crew took the win. More details, interviews, and GT Daytona and Prototype Challenge news to follow.